.OBJ – National Design & Craft Gallery, Kilkenny. Makerversity Presents: Common Works – New Wing, Somerset House, London. Overview An experimental animation made entirely from woodblock prints, produced using a combination of traditional cell animation, hand printing techniques and custom digital programs. Taking its name and narrative inspiration from the 17th century Japanese art form “Ukiyo-e”, Pictures Of The Floating World is an experimental animation made entirely from woodblock prints, produced using traditional cell animation techniques and custom digital programs. Producing a film from woodblock prints using traditional printing methods proved to be a grueling challenge, so we developed custom programs and scripts to automate as much of the process as possible. This created a more efficient manufacturing process and a streamlined digital to analogue workflow. A program was built to identify and remove any repeating frames from large image sequences (walk cycles, for example, may repeat some frames). This significantly reduced the overall number of frames needed to be cut. The resulting frames would then be automatically arranged into contact sheets ready to be laser cut into woodblocks for printing. Another program was created to reverse this process. This second program would recompile the image sequence — reinserting the aforementioned repeating frames — from the scanned woodblock prints. A total of 3312 frames were needed to create the final film, spanning 53 large scale artist prints. These were scanned at high resolution and batch processed to automatically reassemble the final film in a process that resembles the ‘online-offline’ workflow of traditional cinema production. We collaborated with Sound Design studio Cassini Sound to create the film’s soundtrack and sound effects. The soundtrack was created by sampling and layering recordings of wood percussion instruments and blending them with synthesized sounds. The resulting composition reflects the processes used to create the film through the merging of traditional analogue instruments with modern synthesizers. Pictures of the Floating World was first exhibited at Somerset House as part of “Into the Wild: Decoding the Creative Journey”. A viewing space was constructed from the inky black woodblocks, immersing viewers in all aspects of the project. 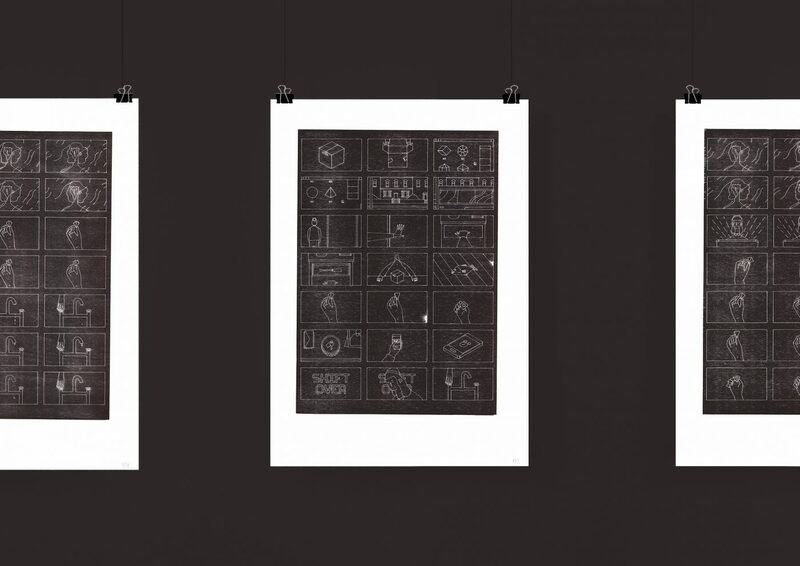 We hung a selection of prints used in the film alongside a process video and the final animated film. The project has been showcased world wide, most notably at the 2017 Vienna Biennial and the Crafts Council's 'Real To Reel' film festival. The full film will be released online soon. Into The Wild - New Wing, Somerset House, London. Craft Council’s Make:Shift – V & A Museum, London. Real to Reel: The Craft Film Festival – Picturehouse Central, London. Festival of Making – Blackburn. How Will We Work at Vienna Biennale – Angewandte Innovation Laboratory, Vienna. Cheongju Craft Biennale – Korea.